Special Containment Procedures: Subject is to be kept in an airtight, soundproof containment chamber, 15.24m x 15.24m x 15.24m (50ft x 50ft x 50ft) until a viable termination method is available. All personnel who enter SCP-469’s chamber (Class D Only) must wear standard Sound-Proofing Anti-Resonance (SPAR) suits at all times while inside the chamber, and communicate only through written notes, hand gestures or text messaging. Absolutely no-one is to touch or even approach the subject with anything other than probing instruments. All equipment taken into SCP-469’s containment chamber must make as little noise as possible, or none at all. Cell phones are permitted for communication between personnel as long as they are muted. 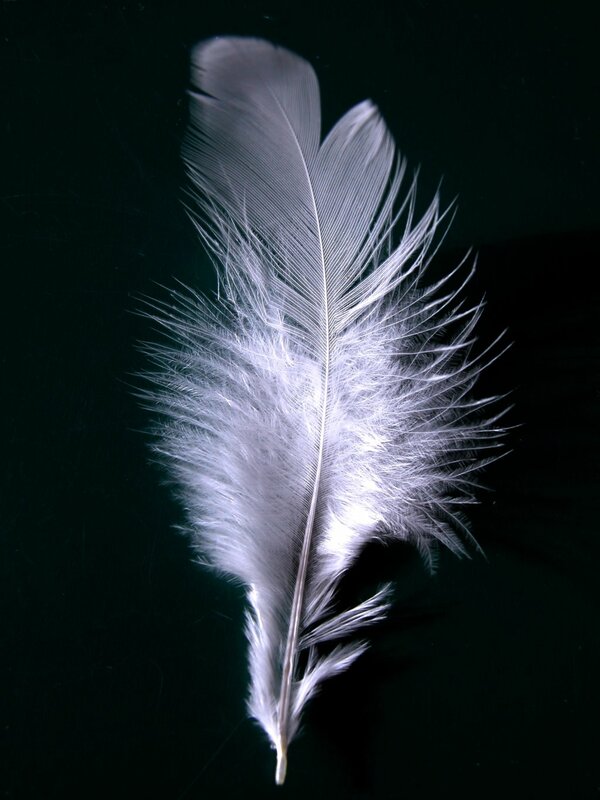 Description: At first glance, SCP-469 appears to be a gargantuan pile of white feathers measuring 8.84m (29ft) in diameter and weighing several tons. Upon closer inspection however, subject is actually a vast array of enormous white avian wings, tightly curled up into a dense mound. Each wing varies in size and span, ranging from a few centimetres to several metres, but all are covered with glossy white feathers. X-rays have revealed the wings to possess a hollow bone structure underneath similar to other birds, though these bones are very soft and flexible, allowing the wings to bend and coil up at angles other birds, and indeed other vertebrates, are incapable of. At the center of the mass is a large humanoid creature, curled up into a fetal position, to which all the wings are attached at its spine. SCP-469 seems to feed exclusively on sounds and sound waves, using the energy gained from sound to grow newer and bigger wings and feathers. The louder the sound and/or the higher the frequency, the faster SCP-469 grows. Though it can be sustained by any sound, it seems to have a preference for rhythmic/musical noises, especially those produced by bells (see addendum). SCP-469 itself, however, seems to make no noise whatsoever due to the sound-absorbing structure of its plumage. Any human or animal that touches or gets too close to the surface of the creature will be quickly enveloped by the outstretching wings and drawn inside. Despite the feathers’ soft appearance, each hair has a sharp point that quickly pierces through clothing and into bare flesh, releasing a neurotoxin that immediately stimulates all the pain receptors in the body, as well as other stimulants to keep the victim from passing out too quickly. This is to make the victim scream loudly, thus feeding SCP-469 even more until the victim eventually goes into shock. SCP-469 is responsible for the loss of four personnel this way. Touching SCP-469 with dead or nonliving objects has no effect. All termination methods of SCP-469 have been unsuccessful. Flamethrowers were initially used, but the noise from the discharging propellant as well as the crackling flames gave SCP-469 the energy to grow faster than it could be destroyed. Cutting and slicing instruments, due to their close range, resulted in failure and the loss of two agents. Acid immersion is being suggested. Addendum: No bells are to be rung anywhere near SCP-469 (No less than 15.24m), including alarms and recordings of bells. The sound of ringing bells causes the humanoid in the center to “wake up”, unfurling its wings and proceeding to [DATA EXPUNGED].